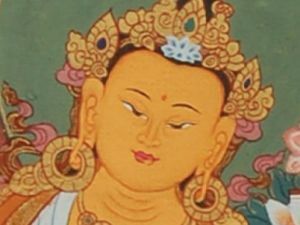 Manjushri is the embodiment of the wisdom of all Buddhas. The text "Professing the Qualities of Manjushri" or Manjushri Nama Samgiti, also known as the "Recitation of Manjushri Names", is one of the most revered Tantric texts in Tibetan Buddhism. It is the first text within the Tantric Buddhist canon, even just before the root text of the Kalachakra Tantra, and the recitation of this text is a common practice to all schools of Tibetan Buddhism. Regarding the Dzogchen tradition, this text is considered crucial in relation to the Vision and practice of Non-Dual Wisdom. Regarding the Kalachakra Tantra, this text is also regarded as fundamental to the understanding and realization of the non-dual Gnostic Body (Jnanakaya) of the Buddha. Tulku Sherdor recently published a new translation of this important text, and translated comments on this text by the Indian Masters Vimalamitra and Garab Dorje and the Tibetan Master Rongzom Mahapandita. During this intensive retreat, Tulku Sherdor will grant Teachings and Commentaries on the texts, as well as guidance on the practices related to the text. This is a unique opportunity to receive Teachings on such important Sacred Texts. The Teachings are an enlightened activity, and, as such, priceless; they are not a material object and cannot have a price tag. Nevertheless, to support the vast amount of resources used for organizing such a precious activity, it is traditional to contribute with generous gifts that are extremely meritorious.